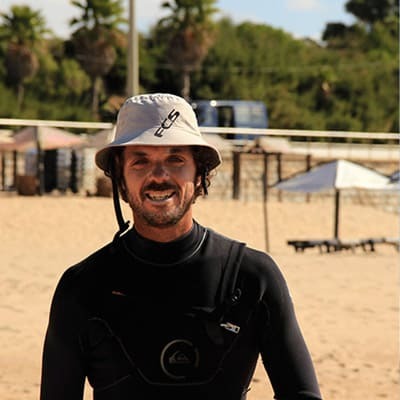 Our instructors are all certified instructors of Portuguese surf schools and have years of experience as a surf instructor, lifeguard and even longer as enthusiastic surfer. 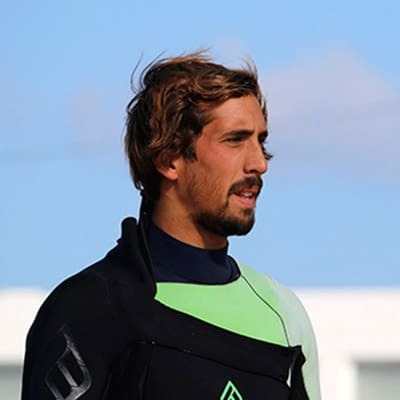 Our instructors are all certified instructors of Portuguese surf schools and have years of experience as a surf instructor, lifeguard and even longer as enthusiastic surfer. They know the surf spots very well. You will be in good hands and our surf instructors guarantee you to learn how to surf in Portugal. Vasco loves surfing and you can tell – he is in it with all his heart. An this he will share with you. 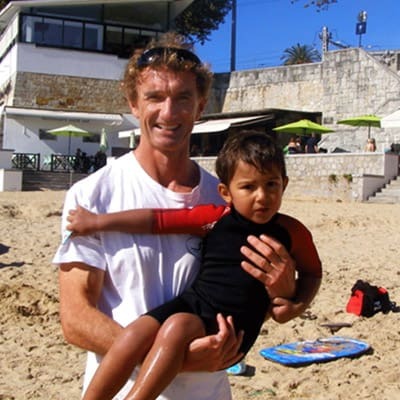 He is certified surf instructor by the Portuguese Surfing Federation (FPS), Coastal Lifeguard and has been teaching now for many years. He started bodyboarding as a young kid growing up at the Estoril Coastline (linha), discovered that he could also surf standing up and is in love with surfing ever since. As a surf instructor he focuses on security and fun, giving attention to everyone and helping each student individually to their personal surfing success. Vasco is a very patient and passionate teacher who will give his best, so everyone is surfing his first wave during a week. Mario is Vascos wing man teaching surfing and also super passionate about it. He is as well accredited by the FPS and holds Coastal Lifeguard certificate. He also grew up surfing in Portugal and has many years of experience in teaching a proper mix of theory, security and in-water practice, giving attention to everyone and make sure everybody is having fun! When Mario is not teaching, he is on the search for the perfect wave himself. Doing so, he gets to travel not only Portugal, but also many interesting countries worldwide. He is looking forward to share his surfing experience with you! 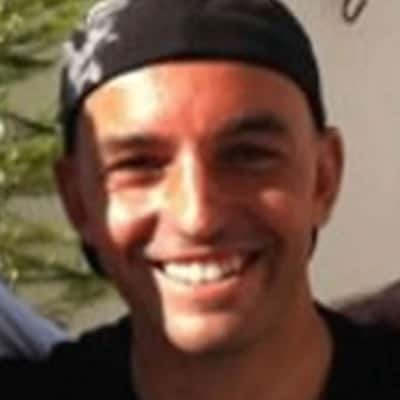 Nick is a certified surf instructor of the British Surfing Association and keen SUP (Stand up Paddleboarding) enthusiast. Having spent a lifetime around the ocean sailing/windsurfing and surfing in various locations a few years back Nick decided to launch a stand up paddleboard school in Portugal after realizing the enormous potential for this fast developing sport for almost anyone any age whatever skill level. With a passion for life and people from all different cultures he realized his dream to work with people and introduce them to this new and exciting sport. The transition from surfing to paddle boarding was an easy one with the added advantage of being able to go out even when the waves were flat and just cruise with friends exploring this amazing coastline. Willie is surfing since he can think. He was born in Sao Pedro do Estoril in a small suburb on the Linha near Cascais. He quickly dominated the waves and became a local hero in the surf community. In his early years he traveled extensively throughout the world and when he came back to Portugal he helped as a pioneer to build up schools in the local surf scene. He was one of the first officially recognized surf instructors and is responsible for training a whole generation of pro surfers. Even today, Willie is respected at the local beaches for his work. In his veins flows the blood of a surf instructor. When he’s not teaching how to surf or surfing himself, he works in the surfboard factory X-Cult (formerly Tropical Energia) just around the corner in Malveira da Serra, where he sprays the final design / airbrush on the boards. As you can see, surfing determined Willie’s life. He knows all the local beaches in the region and is received with open arms. His surfing lessons are very disciplined, so that won´t have the opportunity of lagging behind. He will do everything to make you surf and ride the first waves. Willie still likes to travel around the world. His last surf trip took him to the Maldives. His absolute favorite destiny is and remains the Mentawais, an island group in Indonesia, where he has already been a few times. Rasta was born on the Cape Verde islands, and although he lived most of his life in Portugal, he still has got the spirit of his home deep in the heart. He is always in a good mood and everything looks positive. Rasta was surfing as a young boy and planned to continue till he is unable to. At Praia do Guincho, he is known locally. Sometimes, when it is very crowded in the water he will still get the wave of the day. As if he would know exactly where the waves are breaking. Rasta is in a team with Willie responsible for the video analysis of your surfing session and filming you. In the end he knows what is important to learn surfing and when and what he needs to record. He spent his best surf trip in Spain, where he surfed the famous lefthander in Mundaka. Rasta’s favorite beach is and remains our local beach, the Guincho – no matter what the conditions are like. Once, when the waves were so big that it was almost impossible to surf, Rasta jumped fully motivated in his wetsuit, grabbed his board and ran into the water. Apparently he was so enthralled that he didn’t even notice how big the waves were in reality – not to mention the fact that no one else was in the water (!). Looking back, he says that this was one of his best surf sessions ever in Guincho.